Linisha's Lines, Scribbles and Dots..: Shower..
Reason? Well, the 'ew' factor! But last week I put my reservations aside and drew one!! And guess what? 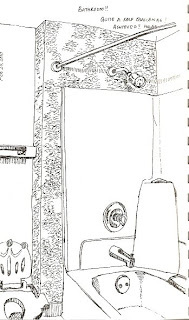 This week's EDM said - 'Draw your shower'! So I am putting this up on my blog too..
Beautiful sketch. Lovely line work. Well done. I like it! It's got a lot of details and perspective. It's very clean and nicely done. Very detailed drawing.. loved it!